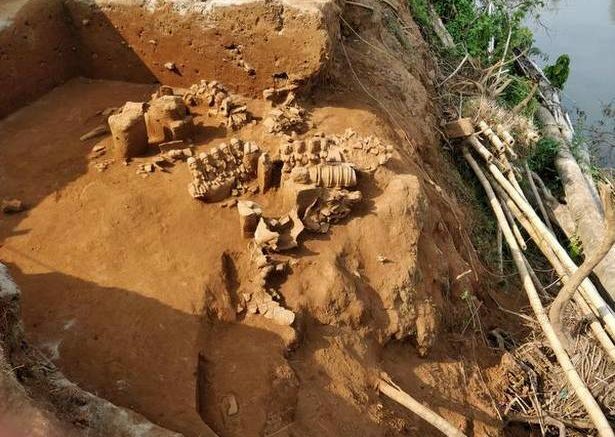 fishermen in the river Pamba in Kozhippalam near Aranmula town in Kerala’s Pathanamthitta district discovered the ancient site. Among the artifacts discovered were idols of mother goddesses (Sapta Matrika), naga (serpent) idols, and many figures of men, reported The Hindu. Each one tells a story. The floods that had wreaked havoc a couple of months ago had pulled down the compound wall that separated the two plots, and thus made the excavation site accessible by road. In the coming months, experts will examine these and the pottery shards to understand their origin and the period they belong to. Some of them, like the stylized naga caressing the upper half of its face with its tongue, have never before been discovered anywhere in Kerala, says K. Krishnaraj, lead archaeologist of the excavation. The site, with its trenches waiting to be excavated and its discoveries drying in the sun, is a surreal sight. Iconographic studies and thermoluminescence dating (TL) of the pieces are expected to reveal more about their age and the lives of people who lived here and worshipped these gods. Be the first to comment on "Kerala floods reveal site filled with ancient terracotta figures"